We put her in here to play with her toys when we're cooking, cleaning, etc. Her new way of telling us that she needs some attention (or someone to come save her from boredom) is to roll over and get stuck in some odd position. 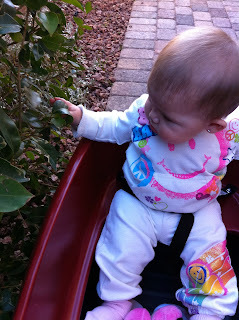 ...The weather has been gorgeous, so we've been playing outside in the afternoons. Grace loves to go for rides in her wagon, so we walk around the backyard taking in all of the awesome sunshine. She likes to see everything and touch whatever she can get her hands on. 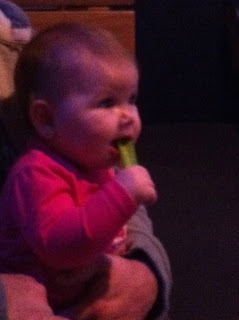 ...Isaac and I went to Buffalo Wild Wings for dinner, and Grace chomped on some celery. I'm sure it felt great on her teeth. When she was done with one piece, she would throw it on the ground and get a new one. 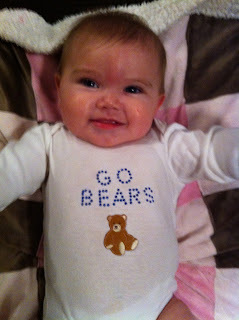 ...we went to Grandma and Grandpa Espejo's to watch the Bears game, so I made Grace a cute little shirt. It's too bad that they lost. I'm really not looking forward to watching the lame Packers and disgusting Steelers in the Superbowl. I may just boycott it this year. ...we went to the park to play on Saturday. 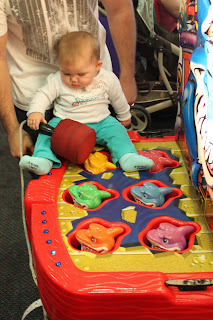 ...Isaac and I took Grace to Chuck E Cheese for some pizza and fun. As we ate, Grace kept eyeing our food. We gave in and let her try some pizza. She had tons of fun, and especially liked watching Chuck E Cheese sing Happy Birthday with the other kids. 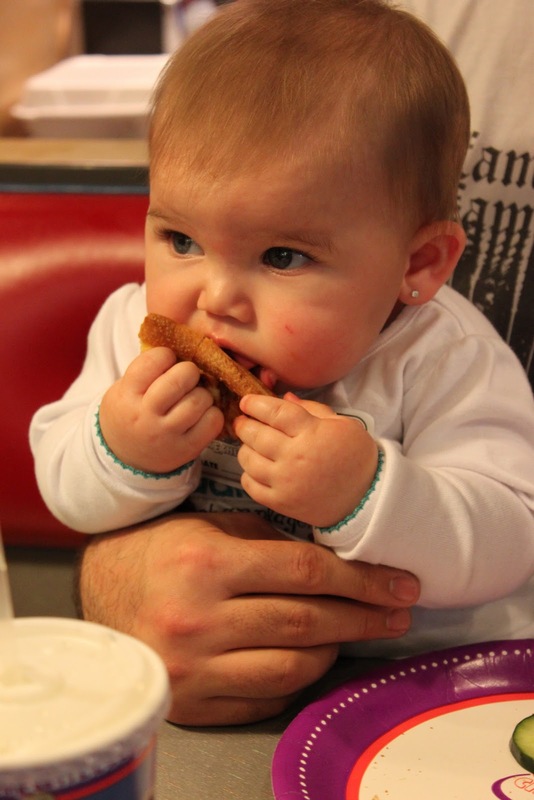 What a great way to end the week! 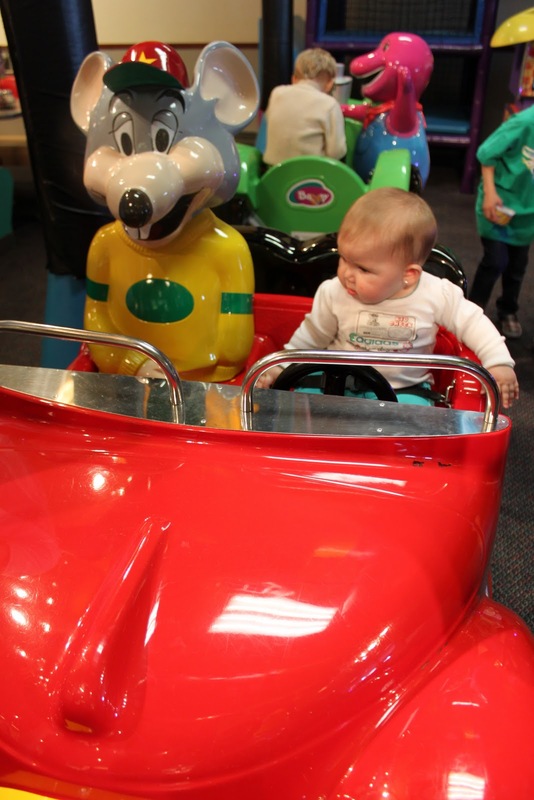 Am I Really One of those moms? !